Meghan, Duchess of Sussex, attends the Prince of Wales’ 70th Birthday Patronage Celebration at Buckingham Palace on May 22, 2018, in London. Editor’s note: If you’re sick of reports on the newest member of the royal family, you should stop reading now. Apparently there’s no rest for the royals: On Tuesday in London, the newly-crowned duchess formerly known as Meghan Markle made her first public appearance since her widely broadcast wedding on Saturday, joining her new husband, Harry, Duke of Sussex, to celebrate his father’s 70th birthday at Buckingham Palace. 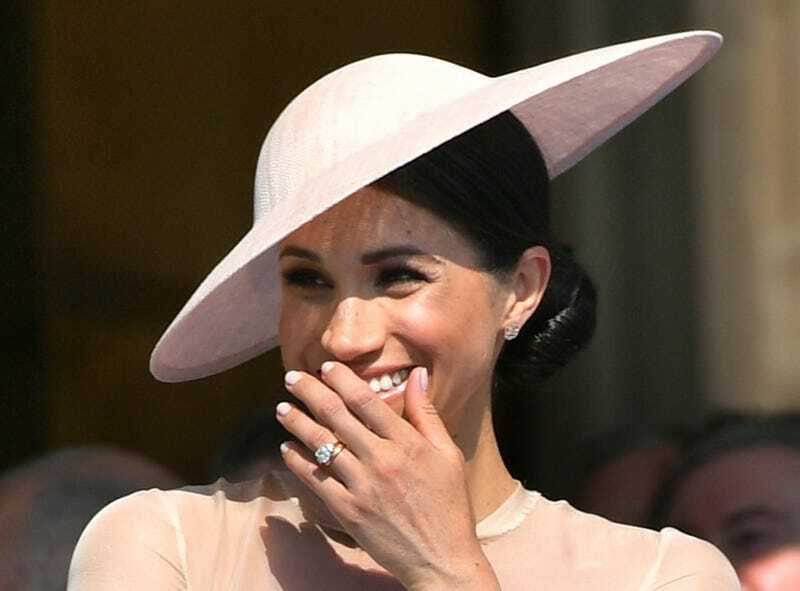 Wearing a blush-colored day dress with an illusion bodice by Goat (currently on sale for $450 at online luxury retailer Matches), paired with a matching bespoke hat by famed milliner Philip Treacy and a satin clutch by Wilbur & Gussie, the Duchess of Sussex was the epitome of restrained British chic, representing her new home practically from head to toe. Meghan, Duchess of Sussex, and Harry, Duke of Sussex, attend the Prince of Wales’ 70th Birthday Patronage Celebration held at Buckingham Palace on May 22, 2018, in London. No word yet on when (or where) the duke and duchess will embark on their honeymoon, but judging by the way Harry was looking at his new bride, the two are still basking in the newlywed glow. At the very least, we can say that the duchess seems to be taking her new title in stride.